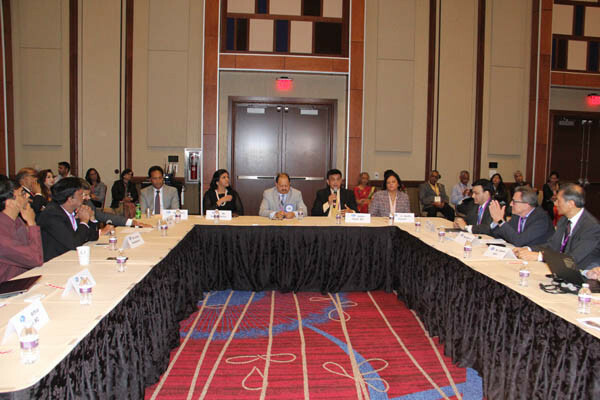 The American Association of Physicians of Indian Origin held its 35th Annual Convention in Atlantic City, New Jersey, bringing together hundreds of physicians and their families, as well as professionals related to the healthcare industry, culminating in the passing of the baton from outgoing President Ajay Lodha to Dr. Gautam Sammader at the June 24 concluding gala. More than 1,500 delegates attended from across the nation attended as Dr. Sammader’s executive committee was announced, consisting of Dr. Naresh Parikh, president-elect; Dr. Suresh Reddy, vice president; Dr. Sudhakar Jonnalagadda, secretary; Dr. Anupama Gotimukula, treasurer; and Dr. Ashok Jain, chairman of the Board of Trustees. Leading members of AAPI pose with India’s Consul General in New York, Riva Ganguly Das (3rd from left) at AAPI’s 35th Annual Convention in Atlantic City, N.J., June 21-25. 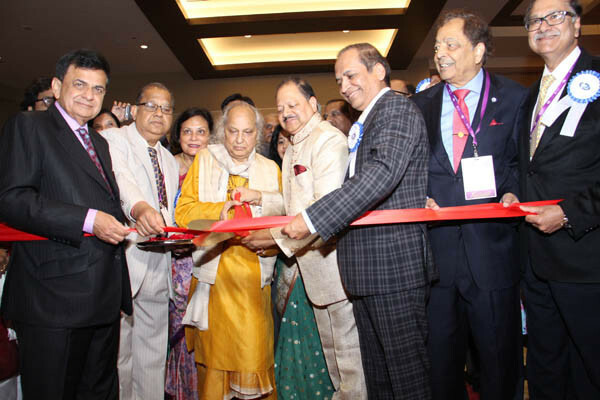 On June 22, with ribbon cutting and lighting of the traditional lamp Pandit Jasraj formally inaugurated the Convention held at the Harrah’s Resort in Atlantic City, leading the 1,000 or so delegates present, in a hymn, and speaking about the warm welcome he had received. In his inaugural address, Dr. Lodha shared the programs and initiatives undertaken during his presidency, such as the Global health Summit in Rajasthan; ‘Crash Courses’ in India for police officers and first responders; EPS lab studies, AYUSH, first ever international research contest; and the charitable works through the AAPI the Charitable Foundation. 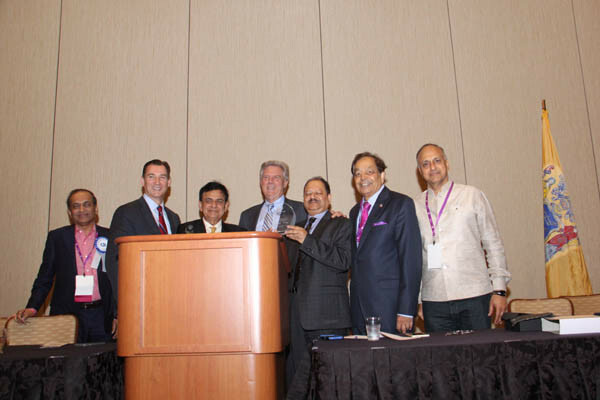 Congressman Frank Pallone (D-N.J.) attended AAPI’s 35th Annual Convention and participated in a Town Hall-style meeting moderated by Padma Shri Dr. Sudhir Parikh, founder and chairman, Parikh Worldwide Media. The five days long convention was packed with CMEs, spiritual discourses, yoga, fashion show, town hall meeting, Bollywood extravaganza, India forum, young physicians forum, children’s activities, and delicious food from around India. An early highlight was the CEO Forum with panelists from the U.S. and around the world, among them, Dr. Sudhir Parikh, Padma Shri recipient and publisher of Desi Talk and News India Times; Joint Managing Director Apollo Hospital Group Sangita Reddy; Dr. Arthur Klein, president & CEO Mt.Sinai Health Network; Dr. William W. Pinsky, , president and CEO, Educational Commission for Foreign Medical Graduates (ECFMG); Dr. Humayun Chaudhry, president and CEO, Federation of State Medical Boards; Chintu Patel, founder, chairman and CEO, Amneal Pharmaceuticals; Robert Levine, executive vice president & COO, Flushing Hospital, New York; Suresh Venkatachari, chairman and CEO of 8K Miles Software Services Inc. and publisher of India Abroad; Amit ”Al” Limaye Logistic Solutions, Inc (LSI); Dr. Amit Powar, CEO of Reading Health Physician Network (RHPN); Saleem Iqbal, CEO, president and director, Habib-American Bank; Neal Simon, president, American University of Antigua; Manjul Bhargava, R. Brandon Fradd Professor of Mathematics at Princeton University; Dr. Madhu Aggarwal, chair, Board of Trustees of AAPI; and Dr. Lodha. The CEO Forum focused on the changing trends in the healthcare sector and how they impact the providers, hospitals, pharmaceutical, medical devices, technology and corporations as well as the patients. Panelists offered their perspectives on what a robust health plan must have to enable business to deliver quality and affordable health care. They shared their views on individual ownership and responsibility for wellness and prevention vs. entitlement and Government role in healthcare. Among recommendations that came out of the panel were the need for portability of insurance across state lines and of the need to increase the number of medical schools and Residency slots that will meet the growing population. Congressman Frank Pallone (D-N.J.) with leading members of AAPI posing for a picture at the 35th Annual Convention of AAPI in Atlantic City, N.J.
Another highlight was a well-attended Town Hall style meeting moderated by Dr. Parikh and Sampat Shivangi, where two Congressmen, Reps. Frank Pallone, D-N.J., and Tom Suozzi, D-N.Y., spelled out their views on the Republican healthcare bill and how it’s going to be affecting the way healthcare is expected to be delivered in the coming years, if it becomes law. Both lawmakers predictably, spoke about deficiencies they saw in how the GOP bill will specifically affect patients, physicians, hospitals and the entire delivery system. However, they acknowledged the limitations in Obamacare, They also answered several questions from AAPI delegates on issues that affect physicians. Some media persons also received awards, including Dr. Parikh and H.R. Shah CEO and chairman of TV Asia. Dr. Parikh also inaugurated the booth of the Rajkot-based Indian non-governmental organization, Project ‘Life’ – which is expanding its reach to North America. Dr. Parikh is on the Advisory Board of the American chapter – Life Global USA. Project Life expects to revive its earlier MOU with AAPI to support several of its medical help programs relating to preventing Thalassaemia. 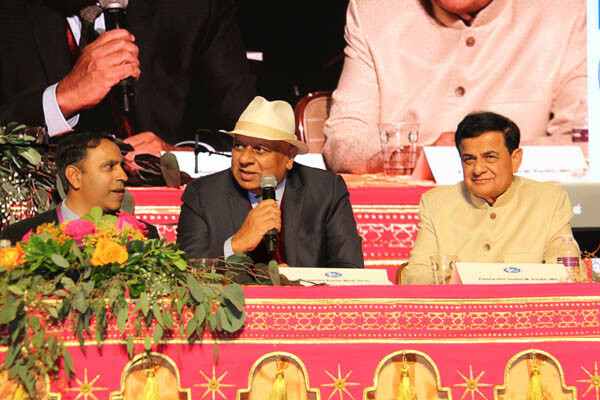 (From left) Congressman Raja Krishnamoorthi, D-Illinois; Bhupendra Kumar Modi, industrialist; philanthropist, and chairman of Smart Global Holdings; with Padma Shri Dr. Sudhir Parikh, founder and chairman, Parikh Worldwide Media, at the AAPI Annual Convention, in Atlantic City. Rep. Leonard Lance, R-N.J., who addressed the BOT luncheon, praised the contributions of Indian-Americans and in particular those of the physicians of Indian origin in the U.S. While criticizing the GOP Bill being considered by the US Senate, Rep. Lance urged the lawmakers to work together to fix the system rather than repeal the Obamacare. Earlier, the day began with Yoga led by renowned yoga guru, Baba Ramdev, who later addressed a packed session, for nearly 70 minutes, leading them to learn and practice simple ways of living healthy. In her talk June 23, Brahmakumari Sister Shivani from the Brahma Kumaris World Spiritual University, spoke at the Women’s Forum, which has come to be a major attraction among the delegates at the annual conventions, and was led by Dr. Rachana Kulkarni, Dr. Udaya Shivangi, and Dr. Purnima Kothari. Panelists at the Women’s Forum included, Dr. Madhu Aggarwal, chair, AAPI BOT; Acting Under Secretary for Health, Office of Public and Intergovernmental Affairs Dr. Poonam Alaigh; India’s Consul General in New York Riva Ganguly Das; Dr. Jayesh Mehta, chair of MCI, India; Dr. Ratna Jain; and Bollywood singer Neha Kakkar. During a luncheon on June 22, Connecticut State Rep. Dr. Prasad Srinivasan, who has declared his run for Governor of the state, in his address, urged doctors to take to politics. “We have the choice to be at the table or on the table. Given our heritage, we the Indian Americans belong at the table. Get actively involved in the affairs of the local community and that’s the path to larger role in the nation,” he said. Speakers at the gala included Congressman Raja Krishnamoorthy, D-Illinois who noted that the success of Indian-Americans had not translated into political clout. Rep. Suozzi spoke about his close association with the Indian American community and praised their contributions to New York and the nation. 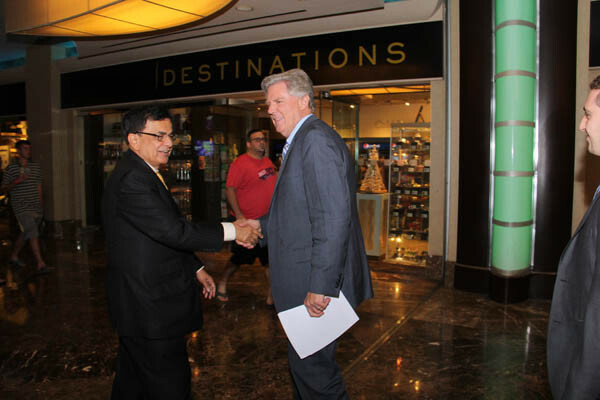 Consul General Das lauded the many initiatives of AAPI, both in India and the United States. “You have excelled in your fields of medicine, and thus make significant contributions through hard work, commitment and dedication to your profession and the people you are committed to serve,” Das said. 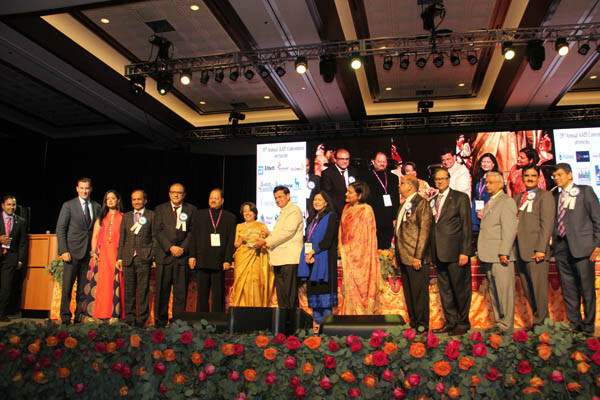 At the Dinner gala, AAPI Charitable Foundation helped raise nearly $175,000 for the various causes around India. Dr. Madhu Aggarwal, urged the delegates to help AAPI establish at least 1 clinic in every Indian state. 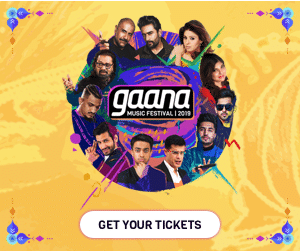 The long night on June 23, saw performances by Bollywood singers Neha Kakkar and Sreeramachandra. Incoming President Dr. Samadder invited all delegates participate at the 36th annual convention to be held in Columbus, OH from July 4th to 8th 2018.